Braly recounts his experiences of numerous jail sentences he served for much of his life. Doc Holiday's name is immediately recognizable, but what most people know of him is based on romanticized accounts played out in the movies. This 1957 biography unearths the real Holiday, who in truth was a gambler and shootist but also a respectable citizen devoted to his mother. The extraordinary true story of a firefighter who may have been, according to U.S. government profilers, "the most prolific American arsonist of the twentieth century." In February 2001, on what started out as a typical Sunday afternoon, Donald Morrill and his wife Lisa Birnbaum became the victims of a home invasion and found themselves faced with the specter of ultimate contingency. In The Untouched Minutes, Morrill recounts and examines the events of that day and its aftermath as well as the circumstances surrounding the murders of Dartmouth professors Half and Suzanne Zantop, which occurred the same week. In this gripping account of the murder and its aftermath, Ricardo Ainslie builds an unprecedented psychological profile of Bill King that provides the fullest possible explanation of how a man who was not raised in a racist family, who had African American friends in childhood, could end up on death row for viciously killing a black man. This concise biography separates the myth from the man. Beginning with a historical look at corruption in American society—along with a clarification of the terms Black Hand, Mafia, and Organized Crime—Capone is presented in his own time and place. A timeline summarizes the events of his life and career. This gritty memoir describes the painful reality of crime and punishment in a California jail, beginning on November 5, 2005, when the author, a parish priest in a small town in northern California, is arrested and charged with 10 felonies after a large bank deposit attracts the attention of the authorities. Ed Butts recounts the intriguing stories of some of Canada's most desperate criminals whose stories have been all but forgotten -- until now! Clubbing, drinking, thieving and fighting became the norm and a wave of increasingly reckless and violent behavior ensued, resulting ultimately in internecine warfare. ‘Razor’ Smith, as a veteran of that scene and former gang leader of the Wildkatz, looks back with honesty, humor and vivid clarity on the days of his youth. Throughout the 1960s, Tony Lambrianou was a trusted member of the Kray Gang. He had a unique insight into the workings of a criminal organization whose reputation in the underworld remains to this day. But he was not just an observer and his role in the Kray story ultimately led to him serving 15 years in prison. Inside the Firm tells, with searing honesty, his violent history with the Krays, and the horrors of his subsequent imprisonment in top security institutions. In exorcising his ghosts, he reveals an account that is more impartial and more terrifying than Ronnie and Reggie ever could have. The author provides a riveting account of the year between 1933 and 1934, when the Dillinger gang pulled over a dozen bank jobs, and stole hundreds of thousands of dollars. The author vividly re-creates the crimes, police dispatches, and court proceedings in this gripping narrative. He poignantly characterizes the players involved, especially those who suffered either directly or indirectly at the hands of Stanley B. Hoss. 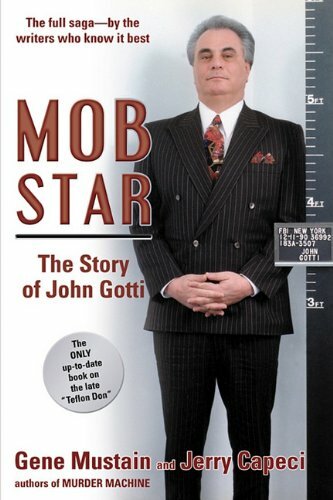 The story of our day's most famous crime boss. Covers 177 of the most infamous assassins, serial killers, frauds, gangsters, murderers, terrorists, thieves, and traitors of American history. By turns funny and sad, frustrating and fulfilling, Dinah Lenney's candid memoir conducts readers through marriage and divorce, blended and broken families—and, finally, the kinds of conflict that infect the best of us under the best of circumstances.